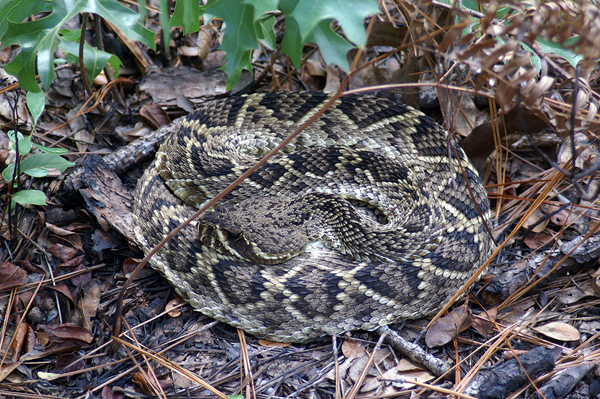 The coloration of the Eastern Diamondback Rattler, Crotalus adamanteus, allows it to blend into its habitat. I was measuring the tree about a yard from this fellow, when my friend pointed out to me that looking where I placed my feet would be good. This entry was posted on Thursday, March 29th, 2012 at 4:35 pm. It is filed under Animals / Wildlife, Environment, Nature, New Images and tagged with camoflage, Crotalus adamanteus, Eastern Diamondback, pit viper, poisonous, rattlesmake, reptile. You can follow any responses to this entry through the RSS 2.0 feed.